Don’t Be Afraid (Oh Darling). It’s going to take a while to write the next entry, a baggy thing that has to cover all of Bowie’s Internet and video game antics in the late Nineties. In the meantime, here’s something I’ve meant to ask readers for a while. The best argument for “Afraid” being apocryphal is that for a long time the track was classed with “Something Happens,” another alleged 1971 bootleg. (The legend is that the tape of “Afraid” came from an American radio interview in early 1972, which seems baffling even if the track is a legitimate Bowie song.) Then in 2008, the illustrated DB board conclusively proved that “Something Happens” was actually a Colin Blunstone song called “Something Happens When You Touch Me,” just slowed down and murked up. So the odds that “Don’t Be Afraid” has a similar secret origin are substantial. That said, no one has yet to come up with any competing theory as to where the track came from. And there were a lot of Bowie demos cut at Radio Luxembourg’s studio in 1971. The singer is obviously not Bowie, and the players aren’t Mick Ronson and the rest of the Spiders. They could be, however, Mickey King (singer of “Rupert”) and the Arnold Corns crew of Mark Pritchett et al. I still don’t know whether, in my book, to dump this song in the “apocrypha” appendix or to include it in the chapter with the rest of the Ziggy Stardust/ Hunky Dory songs. So now’s your chance to vote on the canon: is this a Bowie song or no? Top: Bowie’s first night in America, January 1971. This entry was posted on Thursday, October 17th, 2013 at 9:41 am and is filed under Uncategorized. You can follow any responses to this entry through the RSS 2.0 feed. Both comments and pings are currently closed. 32 Responses to “Don’t Be Afraid”? It would fit in nicely within the great comp Velvet Tinmine. The words ‘Oh Darling’ are not very Bowie like, though the rest has chugs along a bit like Lightning Frightening. I’d love to think it was dodgy saucy Mickey King. Are we allowed to abstain? It’s one that’s been around so long, it’s difficult to think of it as anything other than a Bowie effort. On balance I think it is probably Mickey King singing. It has a bit of a Sweet Head feel about it, not in the lyric but in the clunky structure. More than anything it reminds me more of Gudbuy T’Jayne (spelling?) or a few other generic early seventies rockers. It may just be Bowie cleaning himself of rock cliches between writing his own stuff. that last line is perfect, and as good an explanation of this thing as any. as of now, I’m keeping w/ Bowie fan precedent: the track stays in the official canon unless someone makes a convincing argument against it. It does sound like Mickey King on “Rupert the Riley,” and the guitar riff takes from Bolan, if a little on the twangy side. Plus, it’s known that David was penning some pretty conventional (i.e., boring) rock numbers around this time: Man in the Middle, Almost Grown, Lightening Frightening, the pre-Ziggy Moonage Daydream and Hang On to Yourself. My vote doesn’t mean much, but I’d lean towards authentic. Oh damn, I meant Lookin for a Friend, not Almost Grown. Not that I’d have a clue either way, but it doesn’t sound like his work to me aside from one particular chord change that reminds me of something from another Bowie demo of that time. Can’t think which one though. It sounds like something he wrote during that era, something in the base line and drums is familiar and the lyrical and melodic style do strike me as his (my first thought was Bowie imitating the Beatles and the Monkees at the same time). I think your instincts are right, the song is his but he isn’t singing it. However, I am intrigued as to what info may still come to light. I really don’t care. As long as your book includes every (brilliant) word you’ve written on Hunky Dory through Heroes I’m buying it! Voted for dumping it in the “apocrypha” appendix. It’s very un-Bowie like, a rather unremarkable early 70s rocker. Is DB holding a credit card and been looking at the local phone directory? I reckon he’s just ordered his first US home delivery curry. Which begs the question, why did he stay thin? Please keep this one in the canon, apocrypha and doubt are good, certainty is dull. Do you have a title for your book yet? nah. gotta finish the damn thing first. almost. I’m glad there’s going to be an apocrypha section (my thoughts on that were mentioned in the discussion of “Both Guns Are Out There,” https://bowiesongs.wordpress.com/2012/11/07/both-guns-are-out-there/#comment-12011), and if an item isn’t known to be authentic that’s where it belongs, if I understand the definition of apocrypha. My guess? Bowie wrote this, at least in part. Who are his buddies on the hideous sofa? i thought this was an old shot I recycled but maybe not! this is DB and Ron Oberman, PR of Mercury Records, and I think his brother. 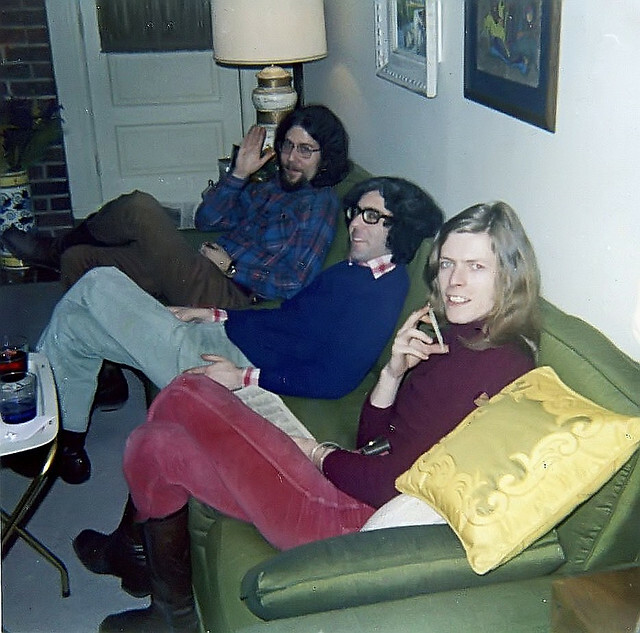 They’re at his parents’ house in Silver Spring, Maryland, the night Bowie arrived in the States. According to legend, they went to a keg party and a kosher deli that night, giving Bowie the full gamut of the American experience. Truly can NOT wait to have the book in my hands; there simply isn’t any other Bowie scholarship on a par with yours, and nothing on him as beautifully written. I hope you can find room for at least a brief autobiographical note telling us how you discovered Bowie and how your fascination developed. I strongly agree with the comments regarding the upcomming book (soooo looking forward to one day holding a copy in my hands!) and am also hopeful for some personal notes regarding when and how got interested in Bowie. No rest for the weary, Chris! yeah, there will be, along with a section on legit. but unheard (a least by me) songs. And is it too early to say, or will we have the option of ordering signed copies directly from you? Yeah, probably too early to get into that, but I hope to get my first editions of both volumes inscribed one way or another. And, as I said on some other post, I dearly hope that this site and forum will remain. yeah: Ernie Johnson, “It’s Gonna Rain Again” (which Pegg’s heard), “Too Fat Polka” etc. Doesn’t sound like Bowie at all. But conversely I still think it’s Bowie singing Penny Lane – so what do i know? Always thought it could be mick ronson this has better clarity than the version ive been playing for years. If its a Bowie song its dull as dishwater.